Hit roll is the formula used to determine the success of an attack. Each time an attack is made on an enemy player, an internal calculation will take place to determine if the attack misses or not. The term "hit roll" is a holdover from tabletop role playing games, where dice were rolled to determine if an attack was successful. There are two ratings which are checked when an attack is made, attack and defense. Having more attack rating then the enemy's defense will increase the chance to hit, and having more defense rating than an attacker's attack rating will lower their chances of hitting you. The hit roll will never drop below five percent hit chance, so it is impossible to become invulnerable with high defense. 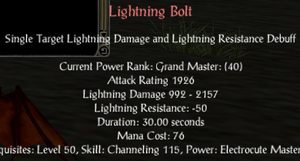 Defense and Meele attack rating are displayed on the character info screen, while spell hit rating is found when hovering over the spell's cameo. Attack rating or ATR, is the number given to most offensive abilities that determines the chance to hit successfully. As a player accumulates attack rating, it becomes harder for their attacks to miss. Attack rating can be increased by training spell or weapon focus skills, equipping weapons with specific enchantments, and precise stance. An attack or spell with no hit rating will always hit. Defense rating or DEF, is the opposite of attack rating. It determines one's resilience to any effects that depend on an attack rating for success. As a player accumulates defense rating, it becomes harder for attacks to hit them. Defense can be increased by training armor focus skills, defense enchantments on items, and defensive stance. This page was last modified on 10 February 2018, at 22:27.